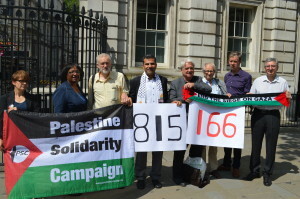 Today, MPs Jeremy Corbyn, Diane Abbott and Jim Fitzpatrick, along with the film director Ken Loach, and Hugh Lanning (Chair) and Sarah Colborne (Director) of Palestine Solidarity Campaign handed in an open letter to the Prime Minister at 10 Downing Street calling for an immediate arms embargo on Israel. The letter was signed by 17 MPs, two peers, and others including Bryan Adams, Jemima Khan, Hanif Kureshi, Will Self, Bobby Gillespie (Primal Scream), Brian Eno, actors Laura Bailey and Maxine Peake, authors William Dalrymple and Ahdaf Soueif, and Ken Loach. PSC put the letter on its website on the morning of Wednesday 23rd July. By the evening of Thursday 24th, the open letter had been signed by more than 21,000 members of the public. Their signatures were also handed in with the letter. 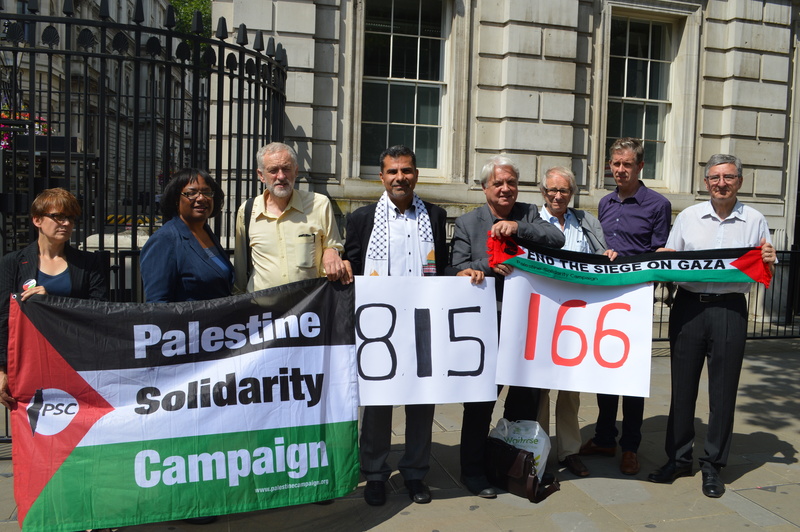 PSC and other organisations have called a march and rally in London tomorrow (26th July), which will also demand an end to the arms trade with Israel. Protesters will gather at the Israeli embassy, Kensington, at midday and march to Parliament. Speakers including children’s author and poet, Michael Rosen, comedian Jeremy Hardy and guitarist and music producer Dave Randall, will be among those addressing the rally at Parliament Square at 2.30pm.